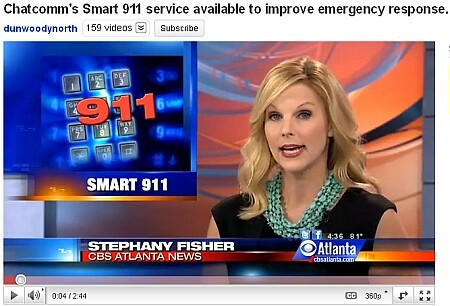 Chatcomm's Smart 911 Service is something every Dunwoody resident should sign up for! The City of Dunwoody & Chatcomm 911 offers you the opportunity to register your household information in advance of you needing the service with Smart911. Here is another video link that better explains the service. At Monday nights city council meeting I questioned the Chatcomm Director on the problematic use of cell phones used near other city borders. These emergency calls are sometimes redirected to a 911 center that is not Dunwoody and I reminded everyone there that one way to slightly increase the level of service for all residents was to preregister all important information on your family, including all telephone numbers with the service. This doesn't correct the routing is the other agency doesn't use Smart911 but it will assist once the transfer is made to the correct 911 Center. I just updated my family information in Smart911 and I highly recommend that do so too! 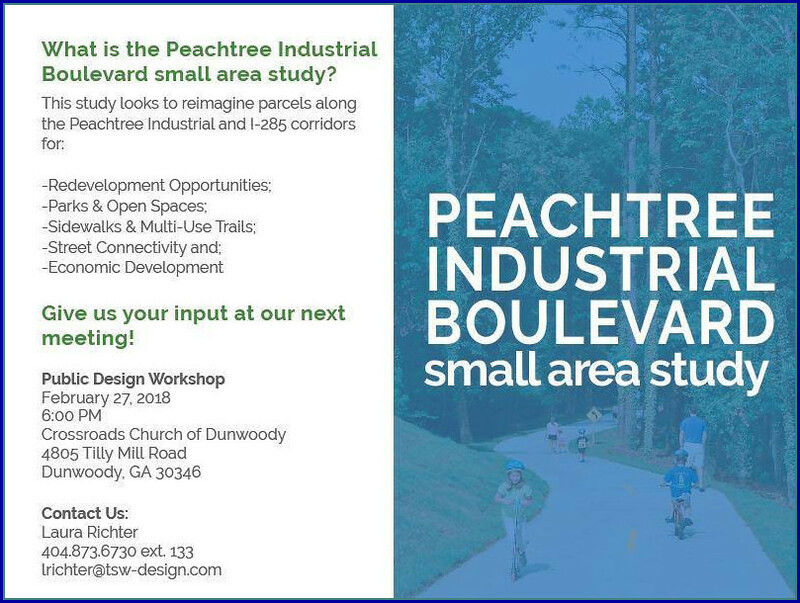 The community is invited to attend the second public meeting to discuss the small area study for the Peachtree Industrial Boulevard Area from I-285 to Winters Chapel Road. The study is intended to establish a community-based vision and action plan to guide investments and improvements within the Study Area. The goal of this task is to assess the subject area’s current land use patterns, transportation patterns and urban design elements, including pedestrian and transit access; access to retail and neighborhood services; diversity of dwelling types; and design for healthy living and social interaction. Below is a link my post from the first meeting in December. 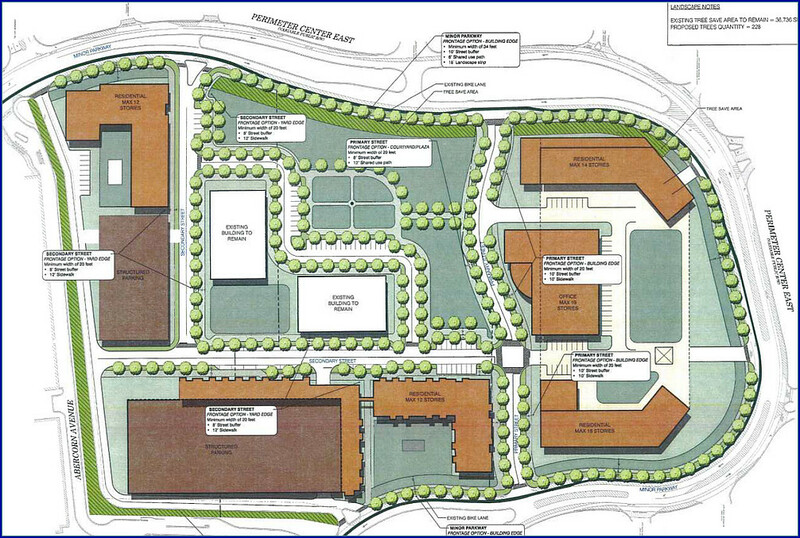 What should the City of Dunwoody do when a developer wants to rebuild a 100 acre apartment complex? Citizen input is needed on Tuesday. 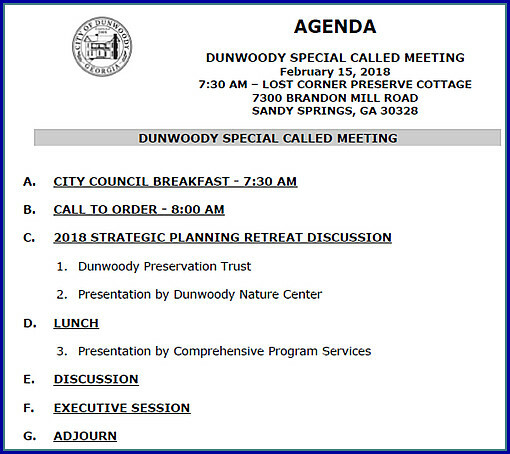 Large Scale redevelopment proposal on the Dunwoody City Council Agenda for Monday. 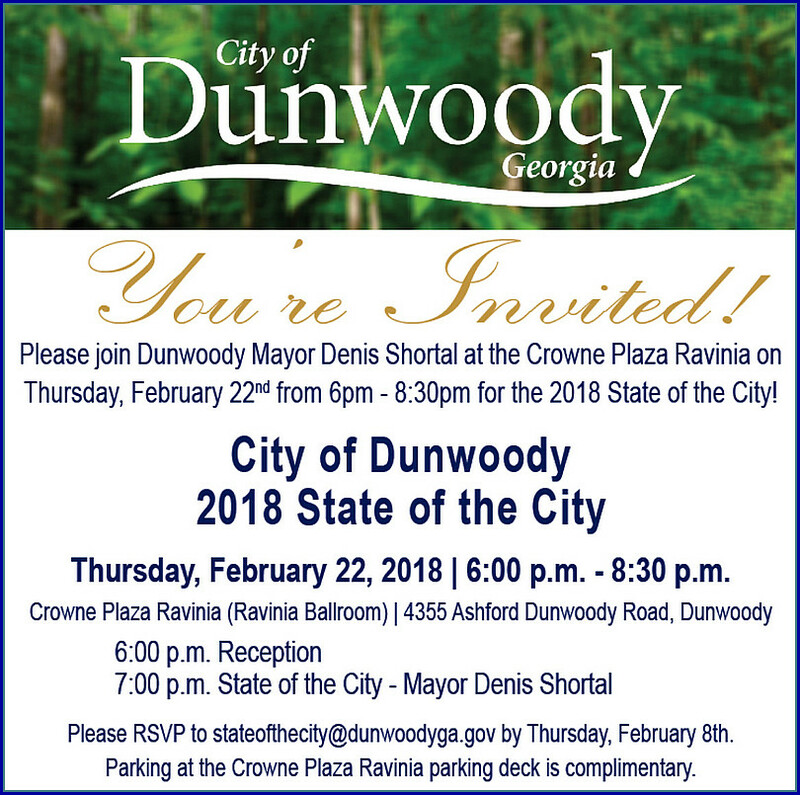 Monday night the Dunwoody City Council will be discussing a large scale rezoning for office & residential in the perimeter area and the developer has offered additional concessions after the deadline of the public packet, therefore I have included it here along with other documentation and information. Chevron Station - Dunwoody Village. FIRST READ: Amendment to Ordinance to Adopt Fingerprint-Based Background Check Process. FIRST READ: Permanent Easement Agreement for Georgia Power Company at Dunwoody Nature Center. SECOND READ: RZ17-01: David C. Kirk of Troutman Sanders LLP, attorney for the owner, on behalf of Grubb Properties, owner of a portion of 41, 47, 53 Perimeter Center East, Dunwoody, GA 30346, seeks to rezone the property currently zoned O-I (Office-Institution) District to a PC-2 (Perimeter Center) District. All Dogs and their humans are welcome! INTERACTIVE GAME STATIONS: fun-silly games to compete in with your dog--Check out our game stations on PetsRFit2 App so you can practice and keep up with the leader board before the day of events! GREEN BEER GARDEN, MUSIC, FOOD TRUCKS, FESTIVITIES! support our PET RESCUE partners--meet your next best friend and learn ways you can help! St. PAW-trick's Day Pet Rescue Fashion Show! Registration requested by Friday afternoon for Sunday event. 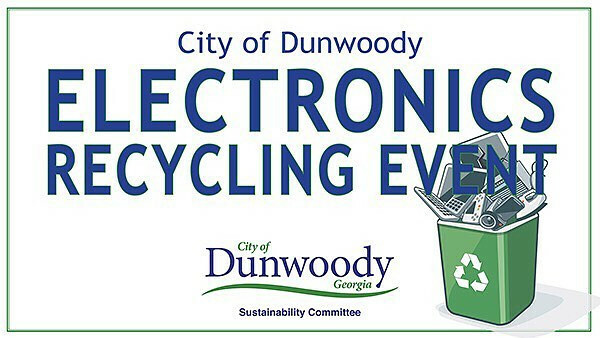 Join the City of Dunwoody for the Electronics recycling event, part of the city Sustainability Initiative, taking place on Sunday, February 25th from 1:00 p.m. to 4:00 p.m. at Saint Luke's Presbyterian Church Dunwoody (1978 Mount Vernon Road, Dunwoody, Georgia 30338 -- Parking Lot). Please fill out the registration form in the link above by Friday afternoon to reserve your spot at the event. 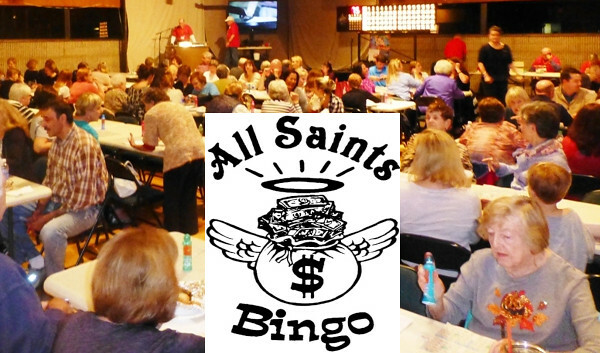 Dunwoody Community Bingo this Thursday Night - All Saints Catholic Church - free dinner included. Dinner menu: Complementary HOMEMADE Bolognese over pasta as well as desserts, snacks and soft drinks. A donation jar is available for those who can contribute. Beer & wine are available for $2.00. BINGO has grown and has produced larger crowds. Due to fire marshal limits, we can only serve the first 175 players so get here early! Join us for an evening of fun, experience the delicious food, all while helping us raise money for our charities. Press Blend Squeeze was started by husband and wife duo Matt and Nicole Scott to make healthy foods as convenient and accessible as fast food alternatives. The expansive menu includes fresh cold pressed juices, nutritious wraps, Acai bowls, healthy salads, detoxifying cleanses and more. Bowls come on a bed of Acai or Pitaya which Matt Scott called “super foods that are low in sugar and extremely high in antioxidants.” Juices, labeled “blends” on the menu, have no added sugars or purees and are made of only whole fruits and vegetables. 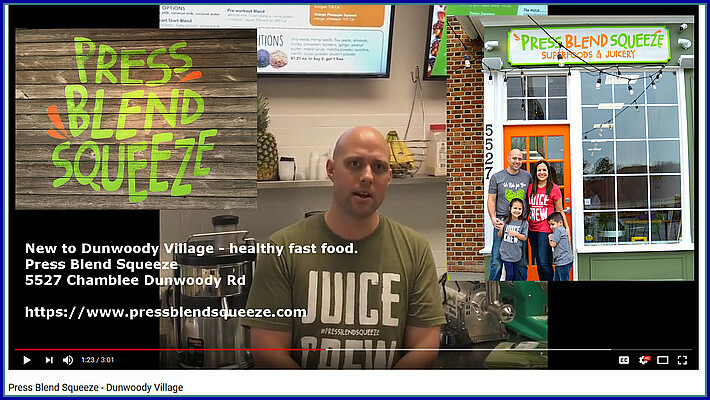 Press Blend Squeeze opened about seven weeks ago at 5527 Chamblee Dunwoody Road, a location that offered a connection with other health conscious people. In the complex is a CrossFit, Pure Barre and yoga studio among other workout options. 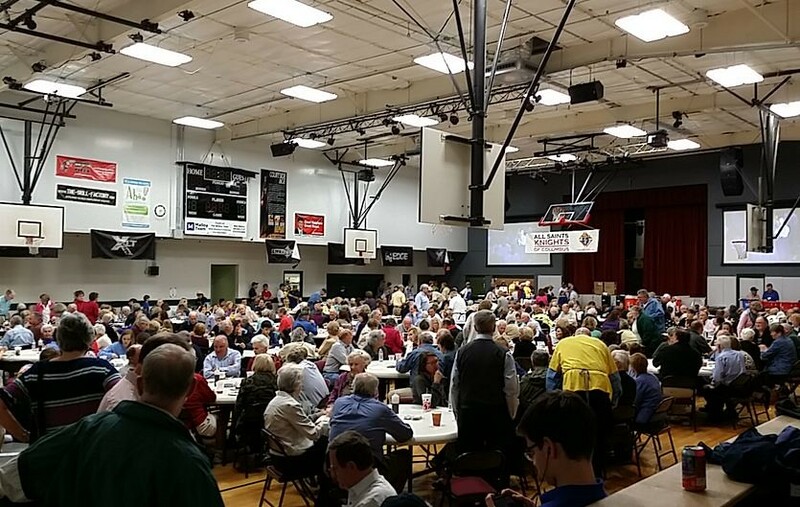 Dunwoody's All Saints Annual Lenten Fish Fry serves up about 1,300 per night - Baked Salmon, Fried Shrimp and the Clam Chowder are my favorites! Fish Frys are back for 2018 Lent! Skip the cooking and come enjoy a delicious seafood meal with your fellow parishioners and other Dunwoody residents. My family attends All Saint's Catholic Church and I'm a member of the Knights of Columbus, a fraternal service organization dedicated to providing charitable services. The Knights biggest fundraising event is our “WORLD FAMOUS” FISH FRY which starts tonight and continues for five consecutive Friday nights with the last serving occurring on Friday, March 23rd. As a member of the Knights, I can tell you that the article in the AJC is correct; the Friday night fish fry is very busy but the service is incredible. At one point last year we were serving a meal every 13 seconds and all of the funds were pushed back into community charity work. The 2018 Lenten Fish Fry's will kick off Friday, February 16th, 5-8pm in the Gym (lower level parking lot). All profits go to our many K of C charities. Meals are $8, or $9 for salmon. Senior discounts of $1 for 60+ from 5-6pm. 2017 year in review & 2018 goals by City Departments, various other discussion items. An eight hour meeting needs a better name than a "retreat". A special thanks to Gerri Penn who has lead the Dunwoody North Civic Association for many years and is finally stepping down from the Presidency. Her leadership and countless hours of dedication towards the DNCA has made this neighborhood a better place to live, for her many years on the Dunwoody Zoning Board of Appeals & the Dunwoody Homeowners Association she has made Dunwoody a better place to live, I will always be thankful. 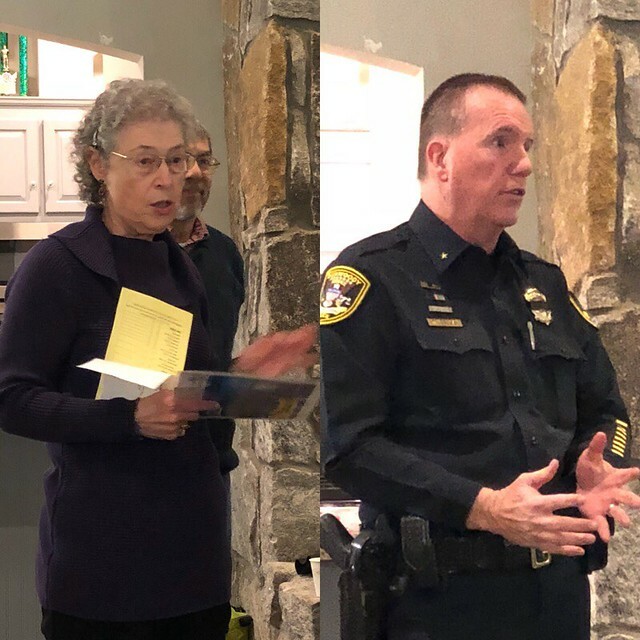 Below is a photo of Gerri and Chief Billy Grogan speaking to the Dunwoody North Civic Association. Thanks Chief for addressing the community, it was greatly appreciated. Dunwoody Youth Council reports on High School Parking situation. Dunwoody High School currently has a major deficit of parking spaces. This has been an ongoing issue resulting in many students parking in the neighborhoods. Many residents have complained about the students parking. Last year, the school added 80 as signed parking spots at St. Luke’s. However, with a growing student population, the parking still is not enough. 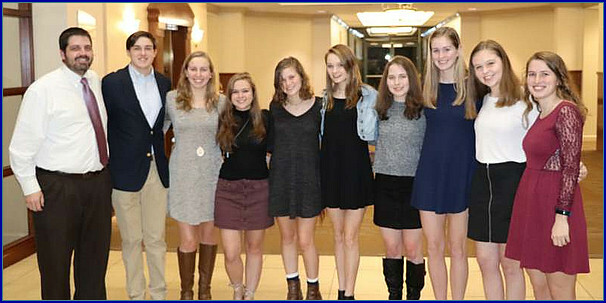 On Monday Night, the Dunwoody Youth Council explained the current situation, projected numbers, plans, and several solutions. Presentation of Unaudited Annual Financial Report. Presentation of 4th Quarter Internal Audit Report. FIRST READ RZ17-01& SLUP 17-05: David C. Kirk of Troutman Sanders LLP, attorney for the owner, on behalf of Grubb Properties, owner of a portion of 41, 47, 53 Perimeter Center East, Dunwoody, GA 30346, seeks to rezone the property currently zoned O-I (Office-Institution) District to a PC-2 (Perimeter Center) District. Approval of a Contract for Design of Roberts Drive Transportation Improvements. Funding Authorization for Womack Road at Tilly Mill Road Sidewalk Construction. Approval of a Construction Contract for the Dunwoody Intelligent Transportation System Expansion. 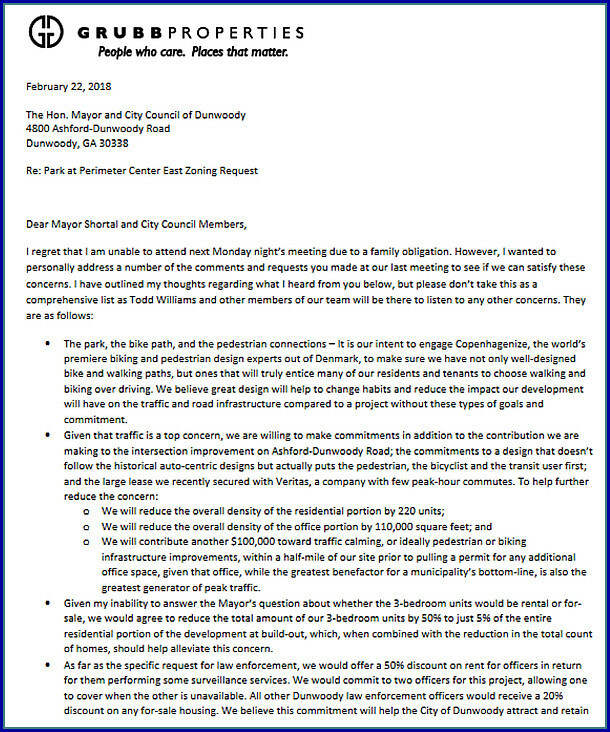 Based on recent news being released by DeKalb County Commissioner, Nancy Jester in her recent newsletter and as reported in the Dunwoody Crier, it sounds like DeKalb County may be ready to announce that they are going to charge the cities different tax rates for General Operations. As you see in the chart above, the City of Dunwoody has one of the lowest tax rates in the County at a total of 39.327 mils. The City of Dunwoody has never raised the "city" mileage rate of 2.74 adopted at incorporation as those are the funds which pays for the Dunwoody Police and other city services like paving & parks. As you see the unincorporated list towards the top, DeKalb Police Department and the special services for DeKalb is much greater than Dunwoody therefore if we were still in unincorporated DeKalb County our current total mileage rate would be 44.090 mils or somewhere in that ballpark. I am opposed to the proposed change for an unequal cost of general operations to be passed to the incorporated cities and though I haven't seen the numbers or their justification, the proposal seems off but I am looking forward to seeing the matrix like above and their reasoning for differences. DeKalb is meeting Tuesday to discuss this item and maybe this information will be released soon. DeKalb also knows that Dunwoody and other municpalities have the the ability to form our own Fire Department and contract out for sanitation therefore once the level of service goes down to a specific level upseting the community and/or they raise the rates on these services whereby it would be cheaper for us to provide our own services - we may just do that. The county's annual budget will be voted on by the board at the end of this month. At this point, I will be voting against the administration's proposed budget. 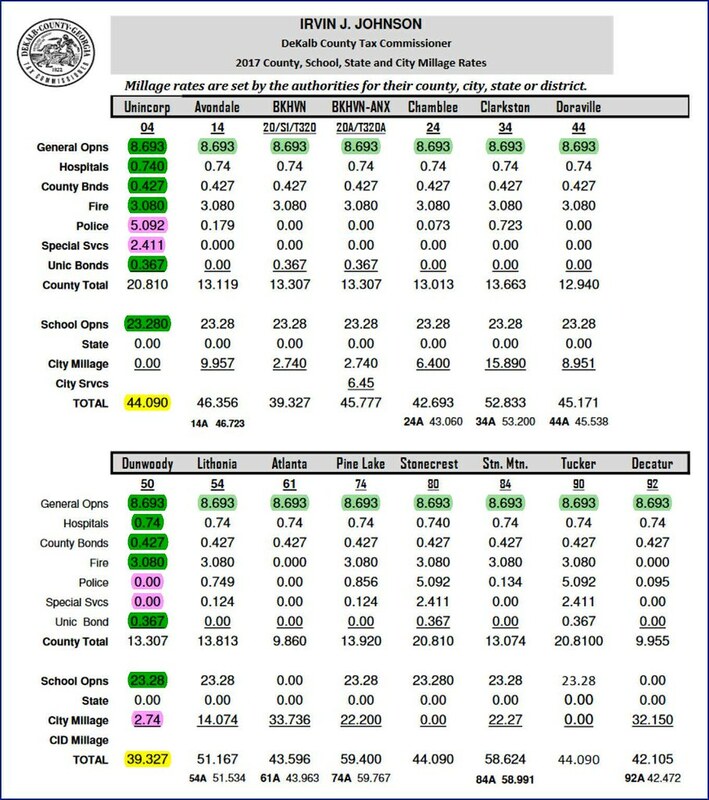 I do not support the fact that the county portion of millage rates will increase for every city in District 1, while unincorporated DeKalb will have the same millage rate as last year. The driving factor behind these millage increases is the county's general fund which is proposed to increase by an additional point. I am not happy with the structure of this budget and the county knows my feelings regarding this point. My hope is that the cities will share my concerns by writing to my fellow Commissioners, the CEO, and the DeKalb Municipal Association (DMA). Kelly Redovian Hughes, age 51, died on February 8, 2018, a little over two years after her diagnosis of a malignant brain tumor. Kelly passed peacefully at home surrounded by her family. Kelly was born in Fairview Park, Ohio, the first of six children for Jim and Sherrill Redovian. The family moved to Atlanta in 1977. She graduated from Dunwoody High School in 1984. She attended Auburn University and graduated with a degree in Nursing. She began and ended her nursing career of 27 years at St. Joseph’s Hospital in Atlanta. Over her career, she worked as the Nursing director for five dialysis centers in Honolulu, Hawaii and as a legal nurse consultant for Hall, Booth, Smith and Slover Law Firm in Atlanta. Kelly touched the lives of so many as a nurse. Her caring and compassionate attitude was always appreciated by her patients and respected by her colleagues. Truly, her passion was taking care of people. As passionate as Kelly was about nursing, the true source of joy in her life was her children, Anna Claire and Max. 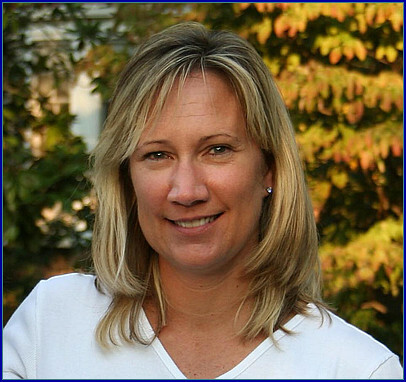 Kelly served countless roles in her children’s lives such as homeroom mother, scout leader, and even team mom. Her tireless devotion to her children could be seen in her willingness to drive Anna Claire, six days a week, to ballet and homeschooling Max for four years. Kelly was a loving mother and devoted wife. She was married to her husband Chris for over 24 years. Kelly is proceeded in death by her brother Timothy J. Redovian. She leaves behind her husband Chris and children Anna Claire and Max Hughes, her parents James M. and Sherrill Redovian Sr., her siblings: James M. (Angie) Redovian Jr., children; Lorie A. (John) Davis, children; Daniel C. (Christine) Redovian, children; and Alex C. (Golsa) Redovian. A memorial service will be held at Dunwoody Baptist Church (1445 Mt. Vernon Rd. 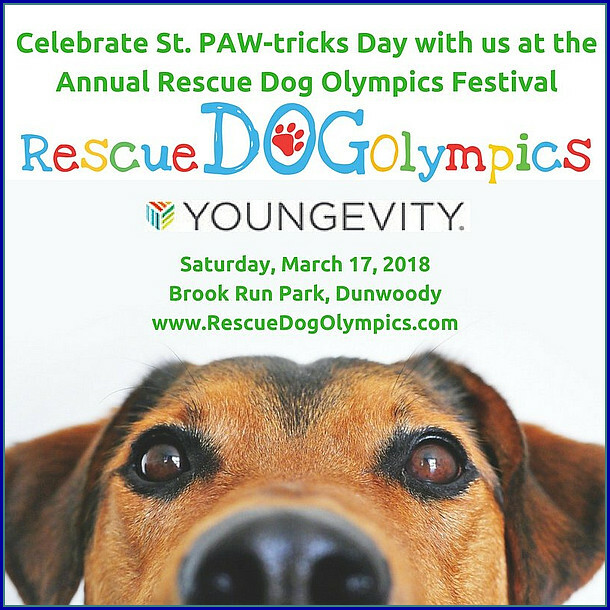 Dunwoody, GA 30338) on February 17, 2018 at 2:00pm. 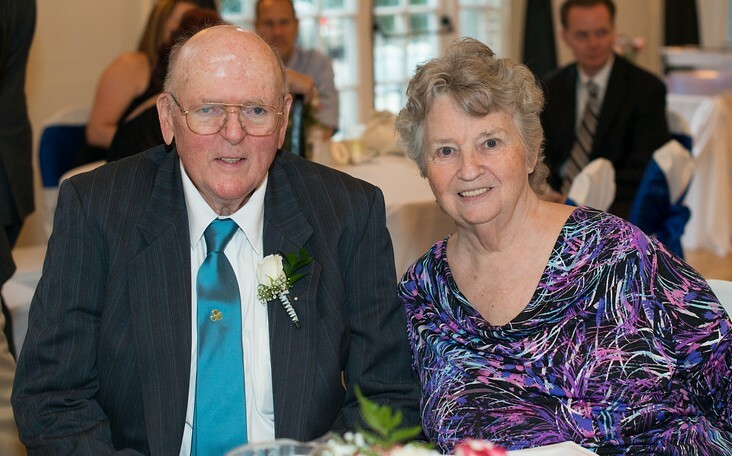 Visitation will be at 1:00 pm and the service will be followed by a light reception. In lieu of flowers, contributions may be made to the Tim Redovian Memorial fund https://timredovian.org/contribute/. Thank you to all for your support, wishes, and prayers over the past two years. Our family is very appreciative of the overwhelming love from everyone. The Hughes & Redovian Families. Dunwoody Mixed Use Project proposed on former City Hall site - 2 acre park, 300 apts, 900 condos, 19 story office tower, restaurants & shops. On Monday night the Dunwoody City Council will be hearing a proposal by Grubb Properties to rezone the former City Hall site and related buildings on Perimeter Center East to allow a mixed use project which would be developed over the next 10 years to include a 2 acre park, 300 apartments, 900 condos, a 19 story office tower, numerous restaurants & shops. If passed by Council, I believe this would be the first rezoning that would allow an increase of rental multi-family units but the size of these rental units would be limited in scope to focus towards young professionals working in the area. The 2 acre park is an amenity that is sorely needed in the area and when surrounded by shops and restaurants located in the first floor of the two buildings abutting the amenity it might draw businesses from surrounding residential units including the Georgetown community via the new bridge and trail that will be constructed for another project under construction. The new condos would allow members of our community to age in place by allowing them to sell the big family home in order to downsize to single level living. The office tower proposed would add job opportunities to that community whereby many working in that tower might also live in the new complex. The office aspect answers my concerns that the development in that area is already residential heavy and the office adds a balance to the uses. I have concerns on the traffic data that I need to study more but there is language in the agreement that the property will continue funding a shuttle to the Dunwoody MARTA Station. I am not a fan of private streets and I will want to know how that will impact public use. I have concerns on the ambiguity on the number of units in each building as many of the drawings state between 250 & 350 units and am concerned that the rental units may swell and at some point other aspects of the project would be sold off therefore I will be asking questions on that point. Sewer capacity is a huge unknown at this point and is that an issue that needs to be addressed prior to a Council decision? There is a school impact study included in the packet that I need wrap my head around that shows they anticipate this development at complete build-out in ten years adding 65 children to the DeKalb School System. This development proposal includes unit size protections thereby possibly limiting the number of school children as there will be no three bedroom rental units, 50% of all units will be studio or one bedroom, only 10% of the condo units will be 3 bedroom, so I am then assuming that the other 40% of the units will all be two bedroom units. I have concerns about the mix of other "Development Entitlements" that were granted to other properties prior to Cityhood and how if they are developed as planed they would impact city services and quality of life? Do I weigh the maybe of another future development that I would have limited control over, impact my decision on this proposal? Seeing that my parents successfully downsized from a four bedroom single family home to a two bedroom / two bath condo, with a nice balcony, in unit laundry, deeded in building parking, in building storage units, prewired for cable and internet, elevators and a gathering place outside to be social - I see this condo development as a viable option for those seniors who are looking to stay close to family & friends yet downsize to single level living. The list of amenities being offered in the residential units are slim and I would want to hear more details as well as hear about the use of Universal Design to foster aging in place. For the record, I do believe that Perimeter Center is the economic engine that drives the entire city, I consider myself pro-smart growth development and want to see a thriving area filled with offices, hotels, convention centers, retail and residential of various types but I also want to see parks, playgrounds, libraries, green space, and proper restaurants to serve their needs as well as schools, roads and transportation infrastructure that can handle the increased residential capacity. I need to balance the growth of the business center against the impacts that this type of development would have over the quality of life for all residents therefore I welcome your feedback on this issue. 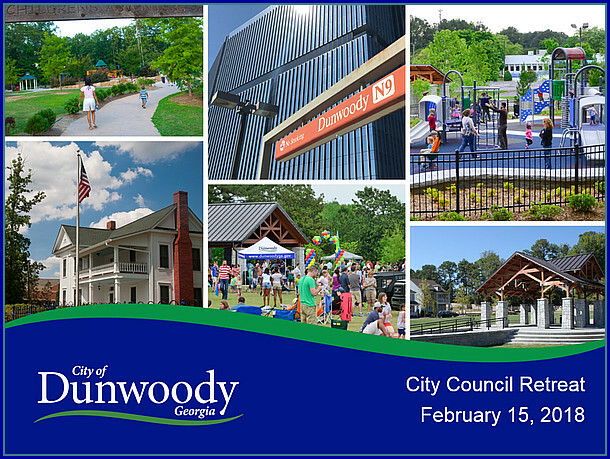 There will be a public hearing Monday night at 6 pm at the new City Hall located at 4800 Ashford Dunwoody Rd NE, Dunwoody, GA 30338 - please join us. This item will not be voted upon for another couple weeks in order to allow Council to have their questions answered and in order to receive community feedback therefore your participation is a vital part of the process. 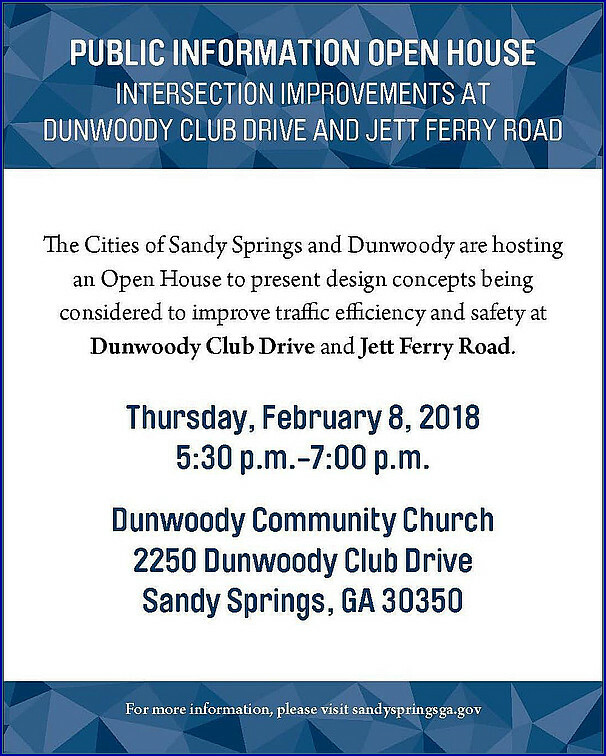 Come to the Open House hosted by Sandy Springs and Dunwoody to review design concepts to improve traffic efficiency and safety at Dunwoody Club Drive and Jett Ferry Road on Thursday, February 8th from 5:30 - 7pm at Dunwoody Community Church.